A fundamental difficulty with this study is that it relies on the toolkits, guidelines, reports and other documents publicly accessible from the organization websites. This introduces the very real possibility (indeed, likelihood) that these documents are not a representative sample of the work being done by these organizations. However, one could reasonably assume that the documents publicly accessible (and therefore included in this study) were selected to be posted online based on their quality, their relevance to current humanitarian crises, or their treatment of current issues in humanitarian aid, and are therefore worthy of consideration here. reports, such as assessments, appraisals, or evaluations of actual aid responses or programs carried out by the organization. Emergency Capacity Building Project (ECB). The Good Enough Guide: Impact Measurement and Accountability in Emergencies. Published by Oxfam GB and World Vision International. 2007. Accessible here. Academy for Educational Development, Population Communication Services (AED/PCS). CAFS Handbook: Participatory Techniques. 2002. Accessible here. Centers for Disease Control & Prevention (CDC), Evaluation Research Team. Evaluation Brief No. 13: Data Collection Methods for Program Evaluation: Focus Groups. July 1998. Accessible here. CRS. Maj, M. et al. 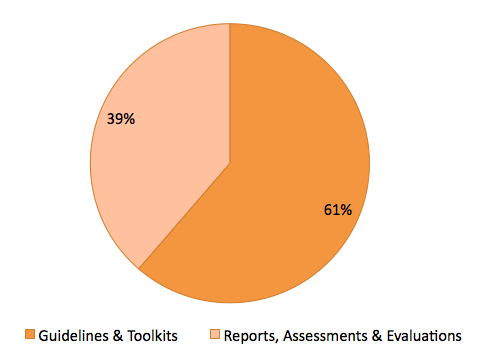 Guidance for Implementing Station Days: A Child-Centered Monitoring & Evaluation Tool. Catholic Relief Services. Baltimore, MD. 2009. Accessible here. PolicyLink. Community Mapping – What is it? (online resource) 2002. Accessible here. Spiers, J.A. “Tech Tips: Using Video Management/Analysis Technology in Qualitative Research.” International Journal of Qualitative Methods, Vol. 3, No. 1, April 2004. Accessible here. STC. “Participatory Video: A Qualitative Method of Monitoring & Evaluation.” Design, Monitoring & Evaluation – Save the Children (blog). Posted 20 October 2009. Accessible here. UCLA Center for Health Policy Research. Health DATA Program. Section 4: Key Informant Interviews. Accessible here. US Agency for International Development (USAID). Performance Monitoring & Evaluation TIPS: Conducting Key Informant Interviews. Washington, DC. 1996. Number 2. Accessible here. World Bank. Transect Walk and Diagramming: Procedures and Examples. (online resource) Accessible here. Stakeholders can be: individuals; interest groups; local authorities; services. Collect 100 dried beans, pebbles or anything similar that are all more or less the same size. Working with a focus group drawn from a specific livelihood group, ask the informants to divide the beans into piles relative to the income received from each source. Count the number of beans in each pile; this number is equivalent to the percentage of annual income to come from that source.